All good things come in threes? Two sunny tours to Patagonia so far, who would have guessed that this is possible? So we’re aiming for a third sunny tour to Patagonia! In one of the popular cafés of Ing. 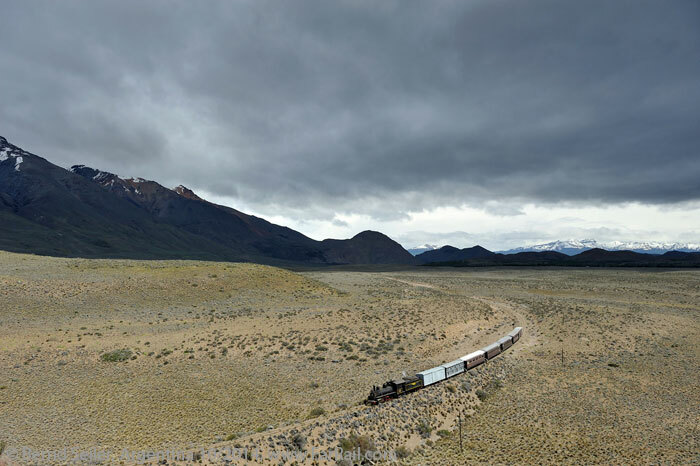 Jacobacci, deep in Patagonia, the walls are decorated with photos of the 750 mm gauge railway, which follows the Andes. 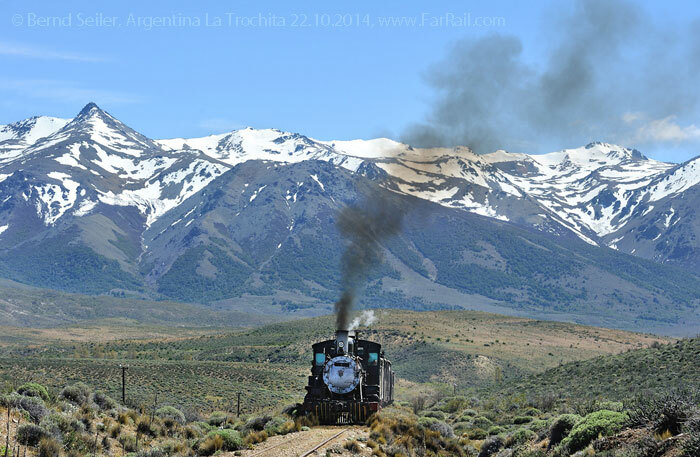 Some of the pictures of the legendary “La Trochita”, or better know as “The old Patagonian Express” show winter events. The winter in the pre-Andes can be photographically extremely interesting, but also stormy with clouds hanging low over the mountains, covering their snow capped tops. Then it would be time to adjourn into the 1922-built wooden planked passenger coaches heated by an iron stove. Alternatively into the restaurant car, which always used to be attached to the trains to have a glass of mulled wine. But when the sun peeps through the dark clouds sending its rays to the train it’s time to get out into the amazing vast countryside to take one of these magnificent shots you can only capture in winter time. The railway closed to regular traffic in the mid 1990´s and this is the first time since then that a special train covers the majority of the line in winter. This is probably a once in a lifetime opportunity to visit this unique railway at this time of year. 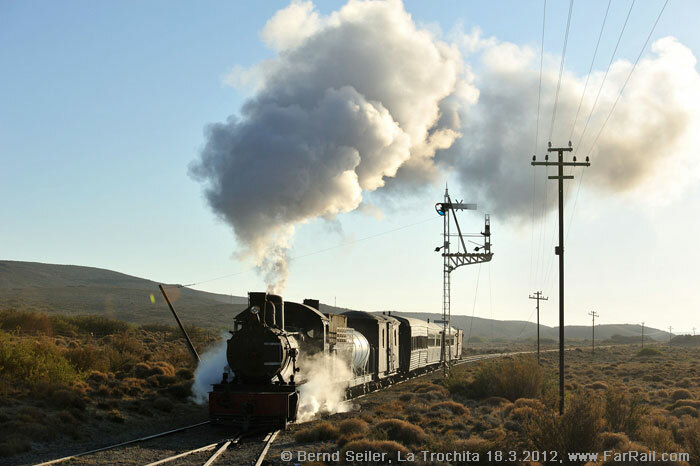 It is the longest preserved railway in the world, and still uses its original locomotives and rolling stock. After our Patagonia tours turned out to be so successful and exceeding expectations we want to visit the fantastic little line again, this time in winter when the weather conditions may allow you some spectacular shots which are not possible in any other season. 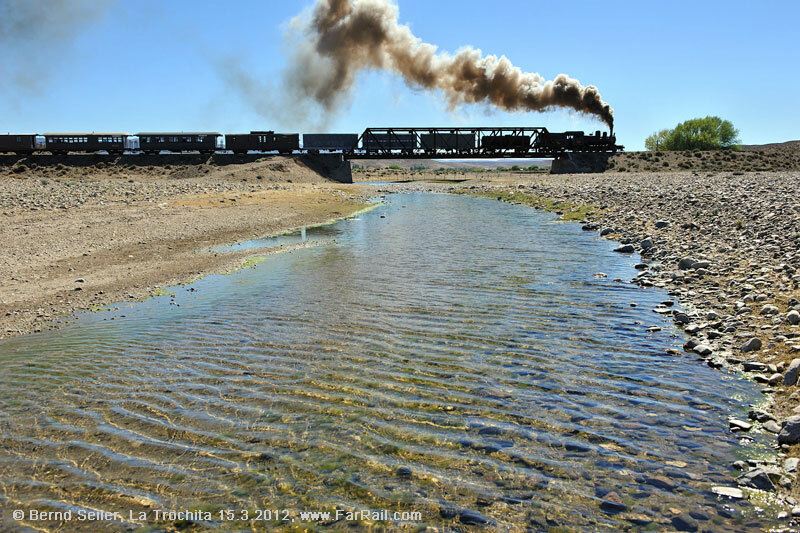 La Trochita  tiny gauge  as the locals call their 250 mile long narrow gauge railway in southern Argentina, compared to the broad gauge line to San Carlos de Bariloche, this 750 mm gauge appears to be really small. 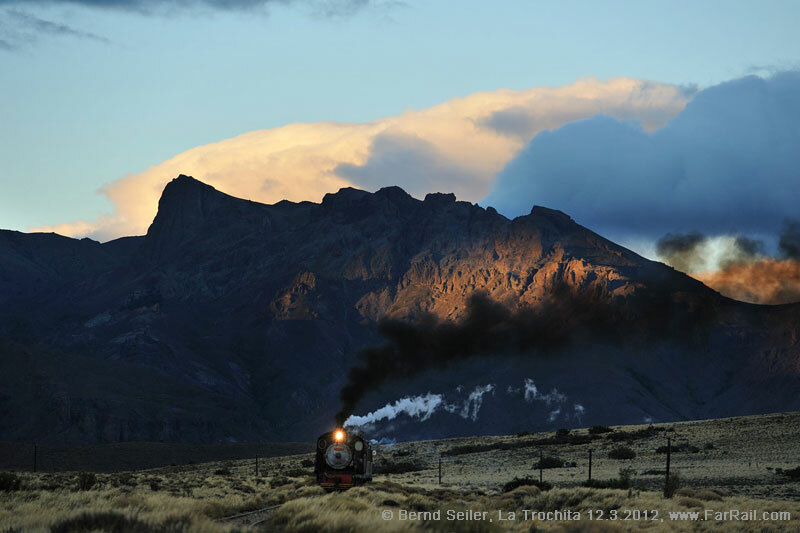 But La Trochita is the longest preserved narrow gauge line in the world allowing the charter of steam trains over its full length  theoretically. Due to political problems a part in the middle of the line can’t be covered. We will travel on more than 65% of the line, so you can have it all: the experience of travelling in a vast open countryside and fantastic pictures and video sequences of the amazing little train crossing it. The line is sandwiched between the endless plains of Patagonia and the high mountains of the Andes, South America’s predominating mountain range. Combining rapid weather changes between dark skies, looking like the end of the world, snow storms, hail showers and crystal clear, deep blue skies, you’ll find an enormous range of impressive situations and photographic opportunities which cannot be found on any other steam railway in the world. This railway is unique in many respects, nothing compares to it. This doesn’t apply to the line only, but also the enormous task of arranging really authentic looking trains here. The available rolling stock from the 1920ies is fantastic, but the details need to be set up properly. Sure, we have to admit that our target is tough and no-one before has asked for what we asked for. That’s why we are not just selling tickets for another operator’s tour, but are offering our own programme for dedicated and demanding railway photographers and video film makers. All this means, for instance, that we’ll try again to remove tourist decorations from the train and include the repainting of tenders to change them from “The Old Patagonian Express“ or “La Trochita“ to “Ferrocarriles Argentinos“ again. As we expect new people in office it’s for sure that we’ll need to work hard on this issue as we did before: starting again and again from scratch, explaining why, funding them, pushing them. Photographs of the line in winter are few. But aunty Google and it’s sister YouTube can help out. Following are three links with wintery photos and at the end you’ll find some more. Once you’ve seen these you’ll wonder why everyone wants to visit Patagonia only in summer. Sure, the weather can be nasty in winter, but this can happen in any season down there. Without trying you’ll never found out what the Patagonian winter can offer. If the sky is deep blue, then it looks like this YouTube video of a light engine movement. Without a train, but the wintery landscape  fantastic! Here you can see the railway line in the right hand corner; just imagine a train on it. And here: the magic with a steam train. 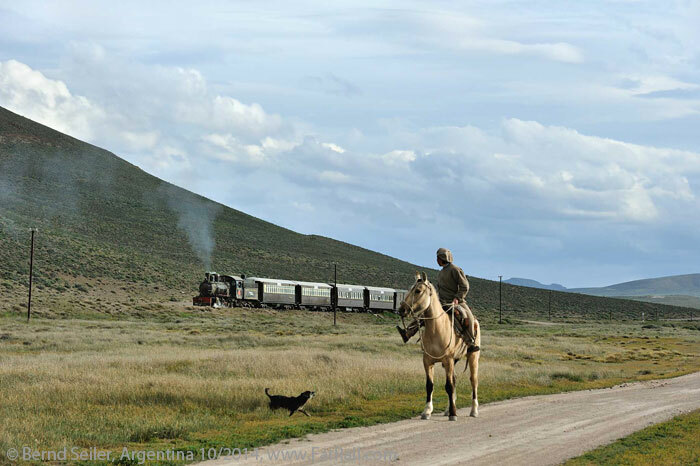 Due to the sharp increase of the prices for the charter trains in Patagonia we had to develop a programme in a way to make it affordable. Don’t even think that the hefty drop of the local Peso has had any influence on the train prices: they’re calculated in US Dollars. Due to their economic crises, they told me that the prices from 2016 have reduced drastically  and then they came up with a price 41% above the price of 2014. It’s a drop against their inflated prices of 2016, but still very high. We fear that a strengthened economy in Argentina would lead to even higher prices (again), hence we want to act now. So come now, it might be your last chance, you never know. Arrival in Buenos Aires and individual connecting flight to San Carlos de Bariloche where the group will meet. In the afternoon we’ll continue with our charter buses to Ing. Jacobacci where we’ll stay in our hotels. At sunrise we’ll start westwards on the dual gauge track. Later the narrow gauge line turns to the south. If we make good progress we’ll reach Cerro Mesa in the last light. Accommodation in provisional dormitories in Cerro Mesa. 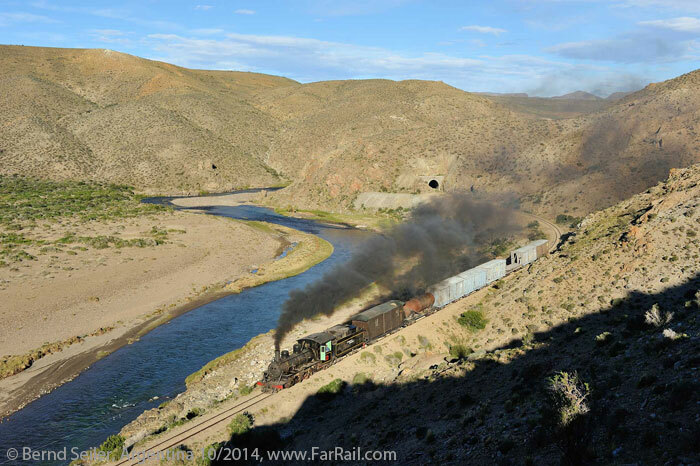 Around Cerro Mesa you’ll find some of the most spectacular scenery of the line. We’ll depart the station in both directions to take pictures and videos in a countryside hopefully covered in snow. Because we’ll take two locomotives from Ing. Jacobacci to Cerro Mesa we have the option to re-arrange our trains several times and also take some shots of a double headed train. Accommodation in Cerro Mesa. In the morning we’ll go by charter buses to El Maitén. Our train towards Norquinco is waiting for us. We’ll cover about half of the way to Norquinco. Accommodation in several pensions, scattered all over El Maitén. We’ll climb up the valley of Esquel to Nahuel Pan and continue over the highlands onwards to La Cancha. 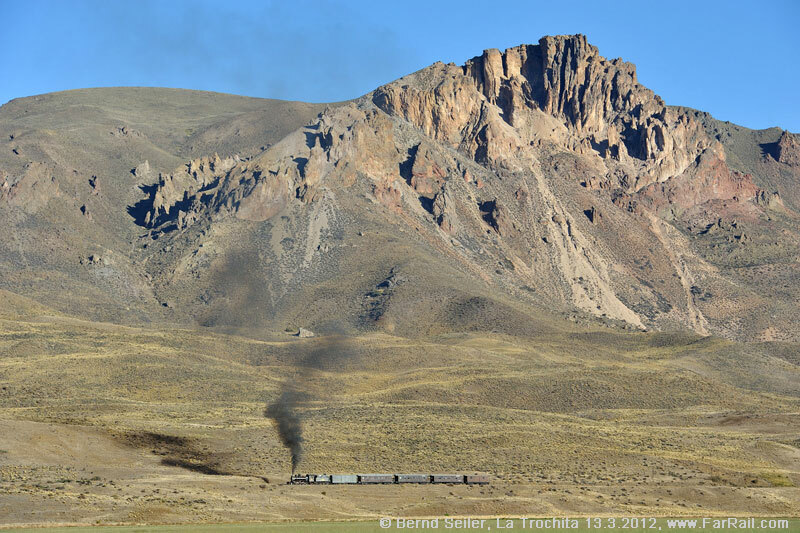 Our train will stay overnight in La Cancha while we will be bussed back to Esquel. Individual return flight from Esquel. Arrival in Europe, Australia or North America. In short: the line is phenomenal and can’t be compared with any other narrow gauge line due to its unique character. 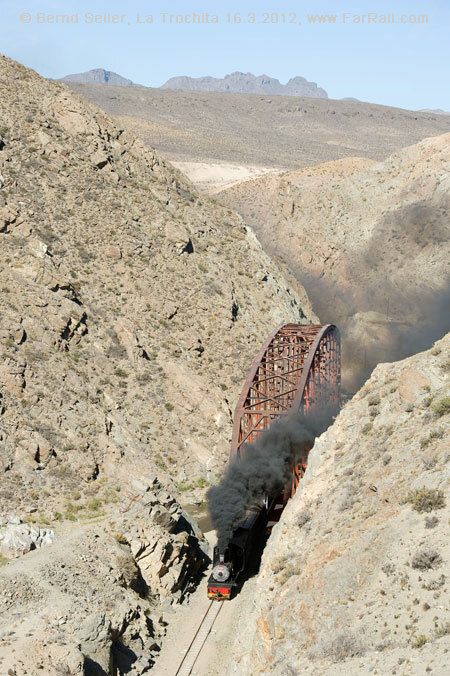 There is no other 250 mile long narrow gauge line offering steam trains! The rolling stock dates from the early 1920s and is 100% original. The locomotives were built by Henschel and Baldwin. We’ll see at least four different locomotives in steam. 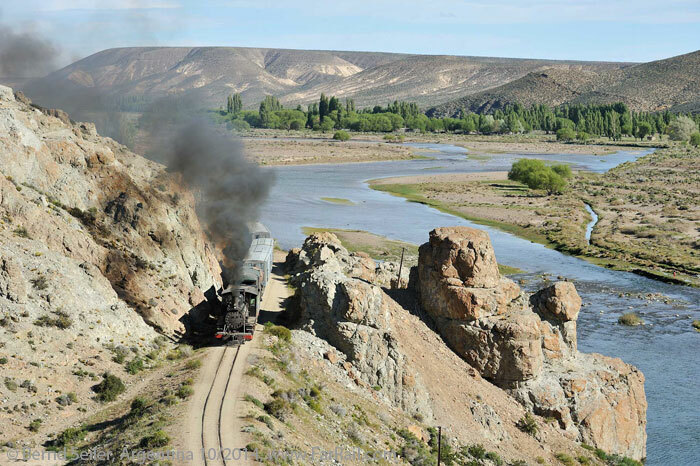 The railway was constructed to give the remote parts of Argentina access to the economically better developed north. 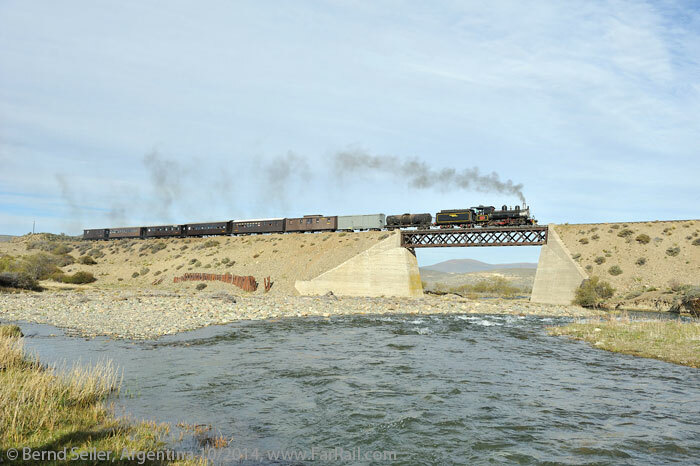 Before WWI there were plans to connect Patagonia to the growing railway network; however, like many other things in southern America, it took longer than estimated. The first locomotives were purchased in 1922, a huge number for a then non-existent railway. They ordered 25 2-8-2-locomotives from Baldwin, USA, and 56 from Henschel, Germany. The latter manufacturer delivered 50 2-8-2 locomotives, four 0-6-0 tank engines (saturated steam locomotives for shunting purposes) and two crane locomotives. The railway track was then laid over 20 years between 1925 and 1945. The long 750 mm gauge line was probably never economical, but its route runs through grandiose sections of untouched countryside. 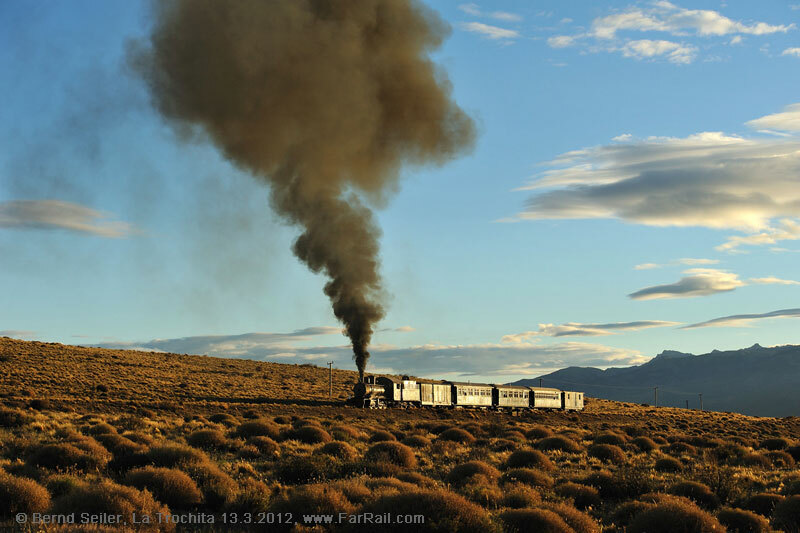 From the railway, you have spectacular views of the Andes, up to 2,500 metres (more than 8,000 feet) high, plus wide valleys and endless grasslands. From Ing. Jacobacci the line heads first south-west and then turns towards El Maitén to the south. West of Río Chico you’ll find the one and only tunnel on the line. To the north-eastern end is a deep cutting and close by is the longest steel bridge on the line (105 m long). 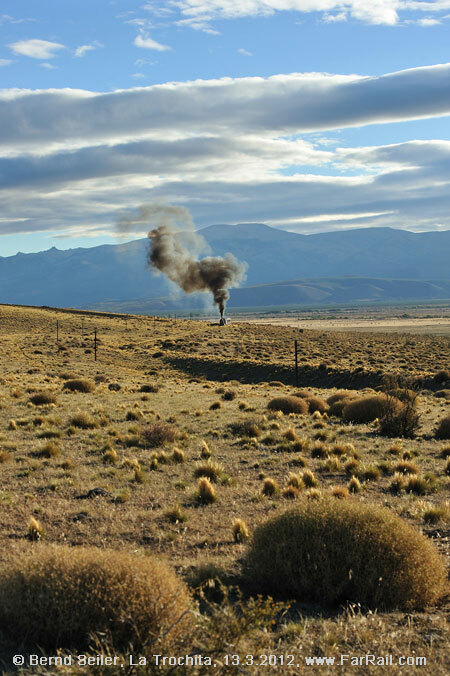 In other parts, the line offers exceptional long distance views across typical Patagonian countryside towards the mountain range of the Andes. Along the way, you’ll find almost abandoned stations, water stations, small and medium sized bridges, many, sometimes challenging gradients and beautifully shaped S-curves. Incidentally, the FarRail logo was modelled on a picture from one of these S-curves on La Trochita! 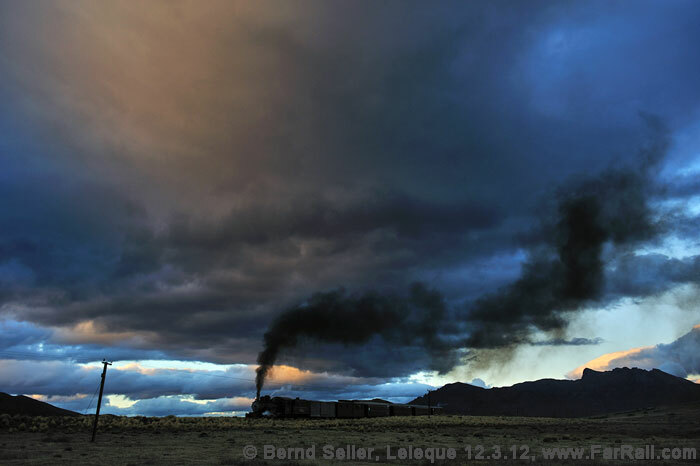 The weather in Patagonia may prevent some of our ideas for photos, but on the other hand it can be a key factor in getting superb shots of dramatic lighting situations, when dark clouds fly over the Andes, while the sun sends intense rays below the clouds and gives our train a glint in front of a black background. It can be very windy in this part of the world and the weather can change within minutes. You should never call it a day because of the weather until the very last light has gone. The most impressive pictures may just be waiting for you shortly after sunrise or shortly before sunset. The winter adds some additional potential for fantastic climatic conditions, although every season has its days when you can’t take any classic shots. To get a feeling for the challenges and advantages of Patagonia please read the trip reports from the previous trips to Argentina. Political conditions can impact state employees, with each election causing unease. Everyone who depends on the government fears the loss of their job. Everything seems to be paralysed and answers are even harder to get than before. No-one wants to move, no-one wants to make a mistake, no-one wants to invest in something. This is a very tricky situation when organising such tours. But from our recent experience in the country, I’m quite confident that the Argentineans will solve the problem their way  at the very last moment, but just in time. Don’t ask how, and don’t ask how well I can sleep with this attitude to sorting out and discussing things, but it’s worked twice already. 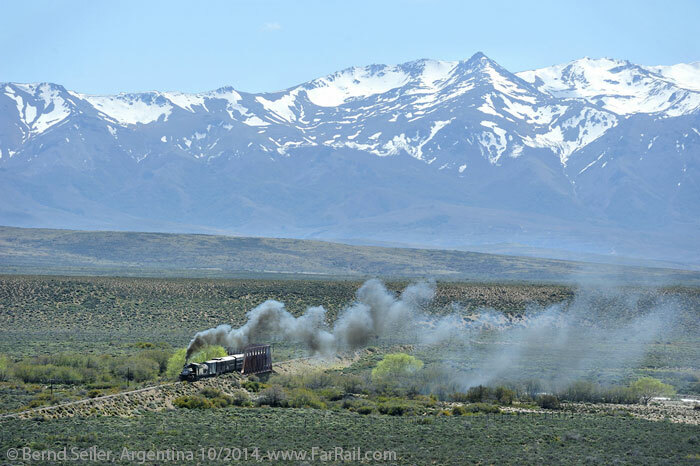 So here is the risky gem of the world again: Patagonia with its most scenic line. Nothing is guaranteed except that we’ll try everything to make it a wonderful success again. 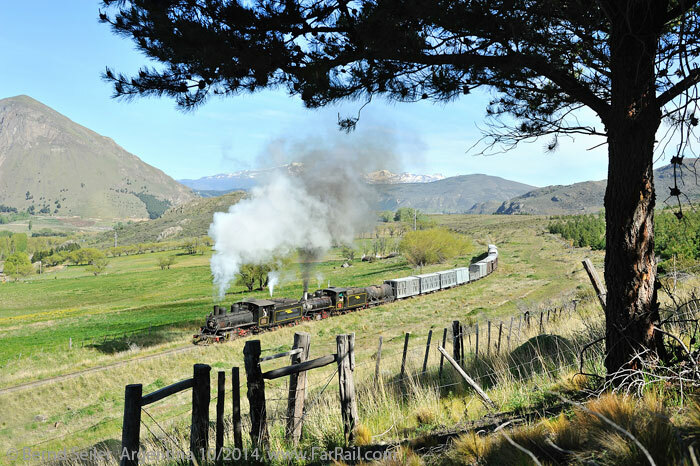 For a long time, it seemed to be impossible to reach an agreement to run authentic trains, and we were really happy to see the ordered freight wagons and locos with “Ferrocarriles Argentinos” logos as we arrived. 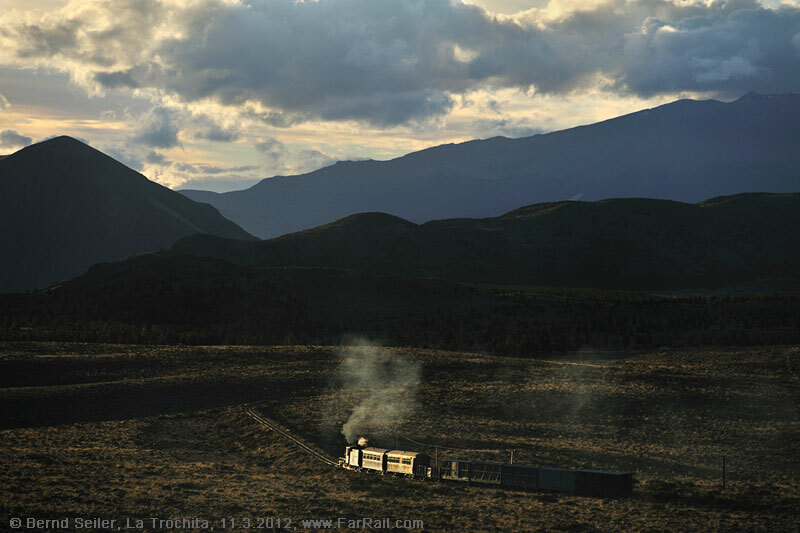 Actually, I went to a general store in Esquel, bought spray paint and, with the help of a stencil, I sprayed the “Ferrocarriles Argentinos” logo on the freight wagons. And this not only happened in 2012, but also on the tour in 2014. Only after I arrived did things progress and on the very last day before the first train was due to move, did they change the tender inscriptions! Arranging such an event didn’t get any easier since then. Please be prepared that not everything will run smoothly, like a Swiss clock. Expecting the worst and hoping for the best is the approach to make this tour an enjoyable one for you. For example if heavy snow falls our trains may be delayed while a snow plough clears the line. We completely depend on the good work of third parties and have arranged the tour in trust. Hence, I have to mention it again: we cannot guarantee anything other than that we’ll always try to make things happen the way we want them. There is no reason to contact a lawyer if something doesn’t work out as planned/hoped/wished/paid for, if trains don’t look as we ordered them or if locomotives fail or derailments occur, etc. From our Argentinean partners we can expect no refund or compensation in such cases, so you must accept that there won’t be any refunds possible in any case. You have to live with the risks if you want to take part in this event, and by registering you accept this as given. From our experience with many other not-so-easy-to-arrange-countries, such as Brazil, Paraguay, Cuba, the Philippines or North Korea we know that it’s very likely we’ll get what we want in Argentina again: excellent pictures, intimate views of the local life and many great impressions. Just as it turned out in 2012 and 2014. The survival of this long line is really quite uncertain, even in the southern province of Chubut. 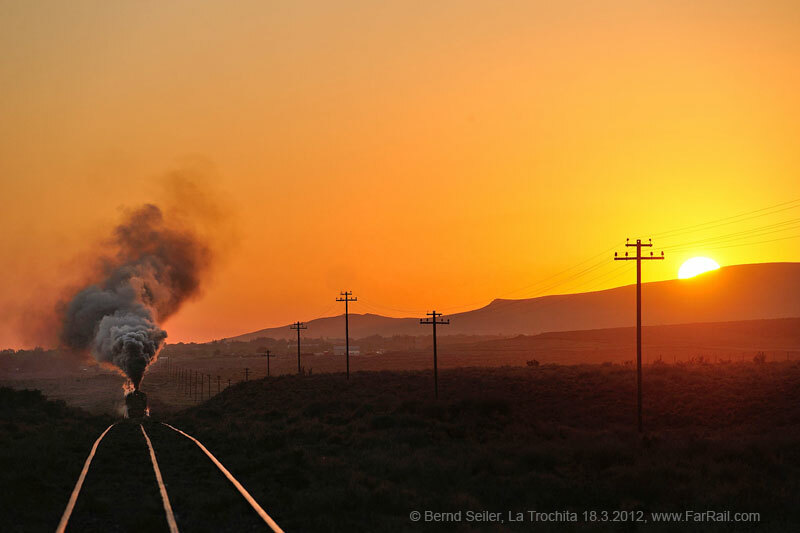 In the peak season of 2013 the railwaymen went on strike  and the governor of Chubut discussed in public the idea of shutting down the line and dismissing the workers. On the other hand: they repaired the broad gauge railway line which was closed after a derailment and destroyed after severe weather  the same which affected the narrow gauge line. There are also announcements from politicians that they’ll keep the line alive. But who believes an Argentinean politician if you don’t trust your own politicians at home (for good reason, I guess)? After the election things may change completely  but it will take at least a year to see the changes. That’s why we go there again now, before cut backs in infrastructure may terminate such tours. In Ing. Jacobacci and Esquel they would need to invest a huge amount of money to catch up with the not yet done but necessary track maintenance. Ing, Jacobacci can be reached only over dusty or muddy gravel roads so far (and by broad gauge train). It’s likely that they’ll invest in their road system first  although they’ve announced a plan to re-open the whole line for regular service with modern railcars. The current government didn’t give a statement about these plans so far. We will  as usual  consider the trains and daylight hours rather than fixed dining times or four and five star accommodation (which are not available anyhow, only prices would match a five star hotel in Europe sometimes). We’re not talking about a shot here and there. 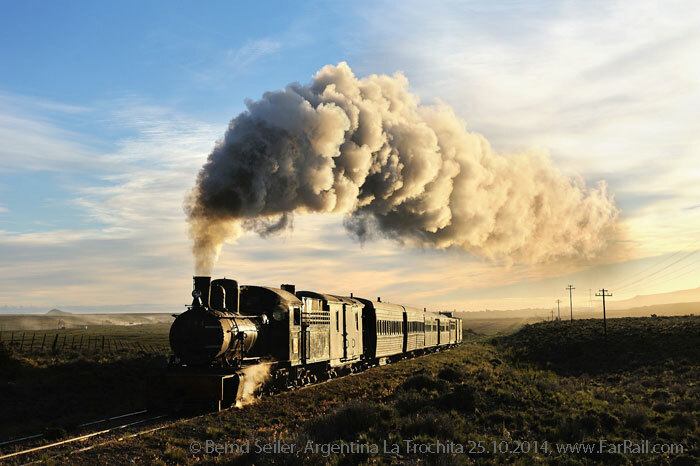 We’re going to Argentina to take stunning railway pictures of an extraordinary line. We want to run authentic looking trains, remove tourist stuff from the locos and wagons and make them look like they did in the 1980s. We’ll offer different train compositions and hope to be able to offer a real freight train as well  which is only possible if we can get them to rebuild the brakes on several freight wagons. This all requires some longer photo days, uncertain times for food and sparse if any comfort when travelling on a freight train (which we’ll do only once). We need our railway crews to work together with us and hence it’s essential that we allow them some rest between the hard days and, for them, also nights to prepare everything. Our hotel in Esquel is a good middle class hotel. Not so in El Maitén and Ing. Jacobacci. The accommodations there (we need to take several because there is no room in one hotel for a group like ours) are of different quality and in Ing. Jacobacci it can be a very simple standard. Some accommodations I would rate with half a star only. However, a hot shower is available everywhere that we’ll book. In Cerro Mesa we’ll probably stay in the local school which they will convert to several dormitories for us. Between El Maitén and Ing. Jacobacci we’ll go over dusty gravel roads. You can’t travel fast here if you want to reach your destination with a bus that still works. That’s why we’ll stay in Cerro Mesa for two nights. Mobile phone coverage in the places we’re staying overnight is good, but in between there are big gaps. Internet is available in most of the places we’re going to, but not in all and, for sure, it’s not as fast as you’re used to. Electricity is available in all our accommodations. Argentina is a safe country to travel to. However, you should always use common sense when crossing roads and railway tracks and consider the risks while taking part in any kind of travel, especially near or on trains. You’re travelling and taking part at your own risk. No risk is covered by any insurance, the hotels do not pass an EU-safety check, the quality of the water is not regularly checked as we’re used to it in Europe, Australia or North America. 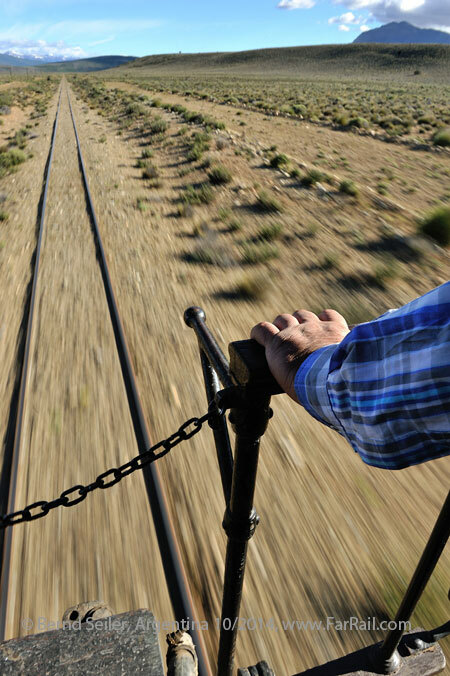 The railway in Argentina is, in many respects, dangerous compared to west-European standards. Do not book this tour if you expect to find a perfectly operated railway using European safety standards! FarRail Tours cannot be held responsible, and will not accept any liability whatsoever in the case of any accident or damage or delay. We suggest you take out a comprehensive overseas accident and health insurance policy. Because of the high flight prices we recommend that you to take out tour cancellation insurance. Travellers from most west European countries do not need a visa to travel to Argentina. Please check with your local embassy, of course a valid passport is required. Prices in Pounds can change more than 5% if exchange rates move seriously.